Is your company interested to reduce waste and implement a recycling programme? Are you looking for tips to start recycling in your company? This article will show you 6 steps to minimise waste and start recycling at your workplace. First, you would need to form a team and get commitment from your top management and colleagues. Conduct a waste audit and find ways to minimise waste through reduce and reuse. Next, start a recycling programme and educate your staff on how to recycle. Finally, remember to gather feedback, review and improve your recycling programme. Highlight the benefits of waste minimisation and recycling to your top management and colleagues, and get their commitment and support. Form a team to be in-charge of the waste minimisation and recycling programme, and ensure that resources are allocated to implement the programme. A waste audit involves finding out the type and quantity of waste generated, and how the waste are generated and disposed. This audit would help you to identify the problems and opportunities for waste reduction. Based on the waste audit, identify the major waste types and find ways to minimise the waste generation. Reduce them at the source of generation or divert them from disposal through reuse. You can refer to the Reduce and Reuse tips at Zero Waste Singapore for more ideas. After your waste minimisation efforts, identify the remaining waste that can be recycled. Find a recycling contractor to provide recycling bins and collection services. You can first approach your current waste contractor and check whether they can provide recycling services. For commercial buildings and industrial estates with recycling programmes, recycling bins or open-top containers are usually placed at certain locations and the recyclables are collected by the recycling contractor for a fee. 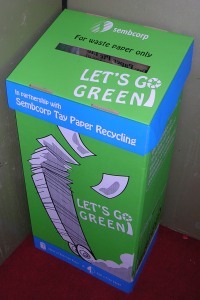 To find a recycling collector or someone who wants your waste, you can use the online business waste exchange for Singapore, Waste is not Waste, which connects businesses and organisations that generate waste materials with those who want the materials, thus helping both parties save time and money while helping the environment. You can also find a list of recycling collectors from NEA’s website. Educate your staff on the new recycling programme – the location of recycling bins, what can be recycled, and where the recyclables end up. The education could be conducted through events, talks and through posters. Gather feedback about the recycling programme from your staff and conduct checks on the recycling bins to ensure that the correct items are recycled. Monitor the amount of waste generated and recycled. Adjust and improve the recycling programme if necessary. 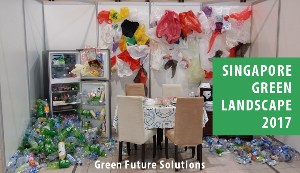 If you have enquiries on the services provided by Zero Waste Singapore, feel free to contact them. What are your thoughts? Do you have experience in implementing a recycling programme in your office? Please leave your comments in the box below.